This is a guide to the college gardens of Oxford and Cambridge, tracing over 700 years of gardening history. It is also tells the story of how architects, painters, poets and philosophers as important as Wren, Hawksmoor, Addison, Ruskin, Morris and Lutyens helped create them. The college gardens of Oxford and Cambridge have survived to form a unique part of gardening history and present a collegiate layout of cloisters, quadrangles, courts and walks unrivalled in the world. This is an informative guide to those gardens and also offers a history of gardening through the ages, covering a 700-year period, from the development of the medieval monastery through to the landscape garden of today. It describes the plants to be found and recounts the story of how architects, painters, poets and philosophers as important as Wren, Hawksmoor, Addison, Jekyll, Ruskin, Morris and Lutyens were all instrumental in helping create these historic gardens. 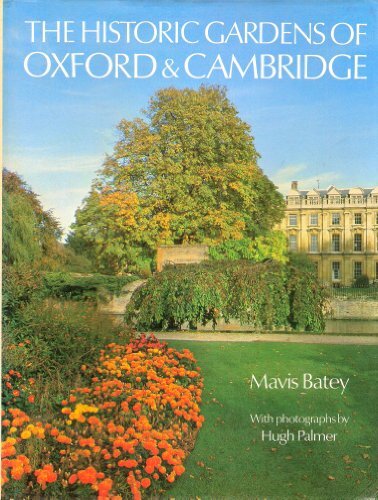 Mavis Batey has written many articles and publications including "Alice's Adventures in Oxford". She designs and restores gardens. Hugh Palmer's photographs have appeared in "Country Life", "Interiors", "Homes & Gardens" and other publications.